A month after being granted a federal trademark for its use and hours after an astronaut in space inadvertantly broadcasted it for anyone to hear, NASA announced that its new crew exploration vehicle will be named Orion. "We've been calling it the crew exploration vehicle for several years, but today it has a name... Orion," Jeffrey Williams was heard saying over an open radio channel from the international space station today. According to the Associated Press, the recording was meant for an announcement planned for next week, but was released in error. After initial denials, NASA issued a release several hours later confirming the name. collectSPACE was the first to report the moniker Orion in July, after a publicly-accessible federal trademark search identified the agency's choice. 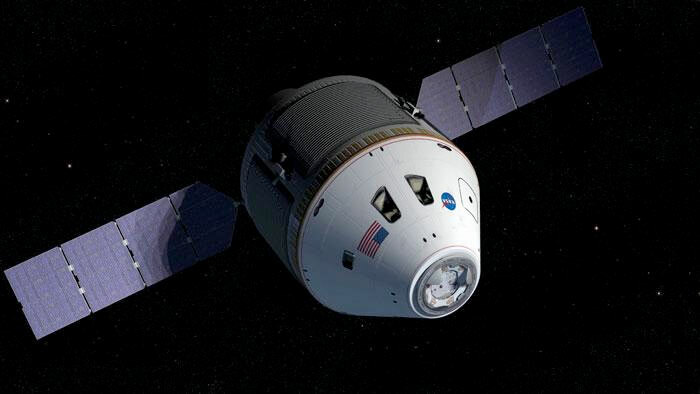 The modern day equivalent of an Apollo capsule, Orion is the vehicle NASA's Constellation Program is developing to carry a new generation of astronauts back to the Moon and later to Mars. Orion will succeed the space shuttle as the space agency's primary craft for crewed exploration. 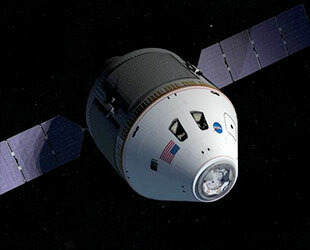 Orion's first flight with astronauts on-board is planned for no later than 2014 to the international space station. Its first flight to the Moon is planned for no later than 2020. NASA chose the name for one of the most familiar and easily identifiable constellations. In June, NASA announced the launch vehicles for Orion, its cargo and future lunar lander have been named Ares, a synonym for Mars. The booster that will launch Orion will be called Ares I, and a larger heavy-lift launch vehicle will be known as Ares V.
Orion will transport cargo and up to six crew members to and from the international space station. It can carry a crew of four for lunar missions. Later, it will support crew transfers for Mars missions, according to NASA's plans. Orion borrows its shape from Apollo capsules of the past, but will take advantage of modern technology. NASA engineers have said that its conical shape is the safest and most reliable for re-entering the Earth's atmosphere, particularly at the speeds required for a direct return form the Moon. Current plans call for Orion to be 16.5 feet (5 meters) in diameter and have a mass of about 25 tons. Inside, it will have more than twice the volume of an Apollo command module. The spacecraft is designed to return humans to the Moon to stay for long periods as a testing ground for the longer journey to Mars. NASA is expected to announce the prime contractor for Orion by the end of the month. Two teams, one led by Lockheed Martin and the other a joint effort by Northrop Grumman and The Boeing Co., are currently competing. Though not released on Tuesday, a logo for Project Orion has been labeled as "approved" in NASA internal papers.